All Woodpecker log cabins and garden sheds are supplied as standard with a pressure-treated timber base, quality doors and double glazed windows (except some 28mm models). 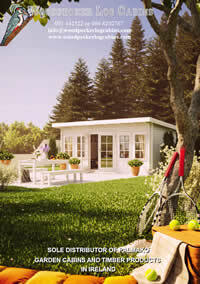 Many cabins also have the options of terraces, verandas, window shutters and boxes. It is best if the cabin is assembled by professionals, but if you are capable of holding a hammer and you have someone to help, there is no reason why you could not manage the assembly yourself. The kit comes with a list of well-marked parts and comprehensive assembly instructions. N.B. As the colour of the finished cabin is a matter of your preference, roofing felt and preservative/lacquer are not included in the kit. You can source your own, or we can supply a range of suitable products at competitive prices. Standard assembly includes delivery, ground work, expert assembly, underfloor insulation, heavy duty felt for roof, external coat of preservative lacquer. Complete supply and fit includes installation of suitable footings/foundation, assembly on suitable footings, preservative/timber treatment, inside and outside (up to three coats on outside). For example electrics for your home office, plumbing and w.c. for your treatment room, sound proofing for your home studio, heating for your garden TV lounge. They can also be fully insulated to provide you with a comfortable year-round working or living space.